Tank And The Bangas Announce New Album With 'Ants' Video Premiere The 2017 Tiny Desk Contest winners are set to release their first major-label LP, Green Balloon, on May 3. Tank and The Bangas are set to release their major-label debut on May 3. 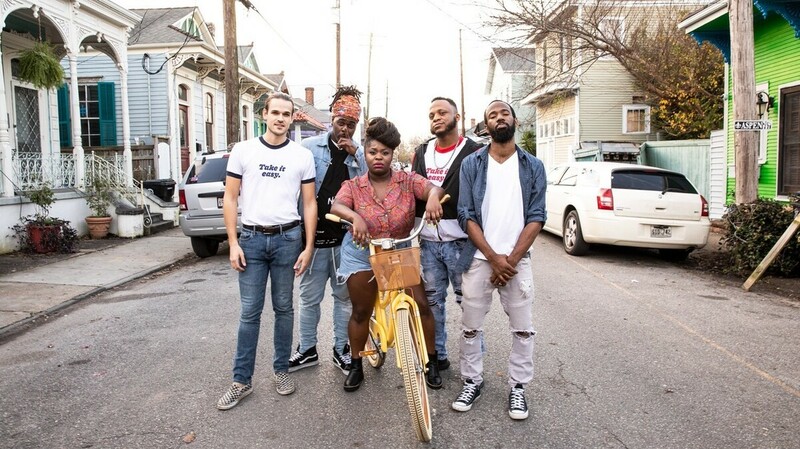 For the last two years Tank And The Bangas have been so busy trotting the globe, becoming festival favorites and making new disciples with every mesmerizing live show, that releasing a new album almost seemed secondary. But, finally, the wait is over. After winning the 2017 Tiny Desk Contest in grand fashion and scoring a record deal with Verve Forecast, they can add their first major-label LP to the mix: On May 3, the New Orleans-based five piece will release Green Balloon, an album whose title speaks directly to the time they took maturing into this moment. "In my growing up, people used to say, 'You green as a blade of grass,'" Tarriona "Tank" Ball tells NPR Music. "They used to say that if you were young or naive, and that's kinda how we felt, and I felt, coming into this industry. We've always been true to what we were doing, but when it came down to this industry, we were kinda new to it." It's been quite a whirlwind for the band birthed in 2011 out of New Orleans' open mic scene, where Tank honed her chops and lit up the city as a spoken-word poet. With the musical gumbo provided by Norman Spence II (bass), Merell Burkett (keyboards), Joshua Johnson (drums) and Albert Allenback (alto saxophone, flute), Tank And The Bangas cooked up a genre-bending brew of jazz, funk, R&B and rap. On the forthcoming album, the studio follow-up to their first release Think Tank, Tank's sense of self-discovery as a songwriter lights the way. The video for the new single "Ants," premiering here, narrates her stream-of-conscious flow with hand-drawn visuals as animated as Tank's trademark soul. "This one right here had to be illustrated," she says, describing the colorful walk down memory lane she takes in the song. "I wanted people to see it because it's a lot of words. People don't grab poetry as quickly as they grab rap. I don't know why; that's just the way it is. Actually, I went through all of those moments. That's literally all of my middle school years." Green Balloon also serves as a metaphor for Tank And The Bangas' own experiential coming of age. "The whole album really is my journey for sure, and ours," she adds, explaining how the color green symbolizes the way her relationship to everything, from money to weed, has changed. "We use to get paid like $10, $20, $50 a show. So, of course, money changes a little and that changes things. It changes your family; it changes you. Not knowing what to do with it sometimes, that changes. Smoking weed for like the first time in my life, and experiencing different levels of being high — green has a lot of significance to me and my life." One place where greenness is not a factor for Tank And The Bangas is on stage. Now it's time for them to bring the growth they've gained as a live band to record. "We love a good stage show so we're always transforming," Tank says. "But this was literally the year when we were all like, 'Alright now, we're ready.'"